The performance area of the Usher Hall is already packed by the time James make it on to stage just after eight for their six-song acoustic set. Given their close to forty year touring history, it’s incredible to note that this is James’ first visit to this beautiful auditorium and its stunning acoustics. “Man up” is the cry from one lone voice in the crowd as Tim explains his ankle injury. It’s an inappropriate shout in many respects given that this acoustic set is about stripping away any macho indoctrination about how a man should behave and display his emotions and exposing the most raw of feelings, something that would make the world a better place if it replaced testosterone-fuelled conformance to historic stereotypes. Jim’s bass, which feels like it’s coming increasingly to the fore both in the acoustic and electric sets, plays the opening notes to Coming Home (Part 2) and immediately it feels like the layers of vulnerability are being exposed. There are moments in these six songs where the music is so sparse, the atmosphere so tense and pregnant with the discomfort often felt by listening to someone reaching deep into their soul and revealing all, that it’s in danger of collapsing under its lack of weight. What James do so perfectly, and often unknowingly to those on the receiving end, is articulate that there’s strength in revealing your feelings and opening yourself up. Broken By The Hurt is one such example, although there’s an irony in Tim introducing it as “another happy one” to huge cheers just as he sings the opening line about suicide, cancer and a lost child. All I’m Saying, about the death of his close friend Gabrielle Roth, is prefaced by Tim talking about her illness being hidden from people so she could go with dignity and not pity. It’s intensely personal to him of course, but, as he comments, it’s something most of us, considering our age, have experienced. When he looks like he’s struggling to hold it together, Saul moves towards him, playing violin inches from him as Tim improvises harmonies, lost in his own world. “This one will cheer you up” is the introduction to Just Like Fred Astaire, which is sung back with impressive gusto by the crowd, sensing momentary relief in the song. At the end Tim holds the final note, but is drowned out by the most ferocious roar. He asks those who’ve had it played at their wedding if the “love is just a disease” verse was edited out before Saul reminds him he sang it at his own wedding. The acoustic set is completed with Hello and it’s here that the stripped down separation of instruments these arrangements is musically at its most affecting. Spine-tingling bass, an achingly tear-jerking piano and violin that cuts deep combine to strip everything right back to the bone, raw and exposed. 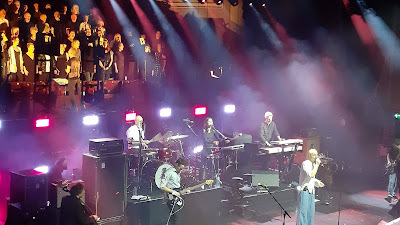 Thankfully there’s an interlude for both band and audience to regain their composure and prepare for the more ecstatic moments of the electric set. Those expecting a barrage of hits as a counter to the indulgence of the acoustic set don’t get their way immediately. Hank opens up with a barrage of drums and other percussion as Tim lays into the republician ideology of Trump and his acolytes before What’s It All About sees them take us on a winding twisting journey of exploration of the side to James that never gets highlighted. Tim braves the audience by coming out over us, needing to be rescued by a security guard who’s particularly hands on in retrieving him which leaves Tim smiling and probably a little relieved given his ankle injury. Waltzing Along and Ring The Bells get the stalls jumping as two of their best loved songs get a roaring reception, the crowd singing the guitar line to the former. For a band so enthused about their new material and committed to looking forwards, they still seem to be able to keep the old favourites fresh due to their rotation policy that ensures they’re rested before they get stale. PS makes a welcome return to the set. It allows Saul to take centre stage on violin before Tim improvises lyrics over an extended ending. 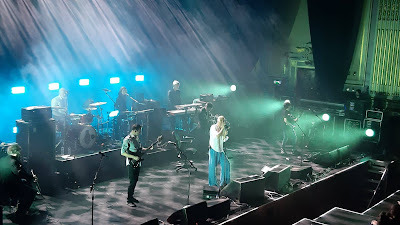 He dedicates the song to Swedish schoolgirl Greta Thunberg who has been the figurehead behind recent school strikes against climate change, telling us our children will echo the song’s “what did you do when the world turned over?” line in questioning the damage we’re doing to our planet. It’s followed by Millionaires-era b-side All Good Boys which ends with the music dropping out and six of them repeating the refrain. 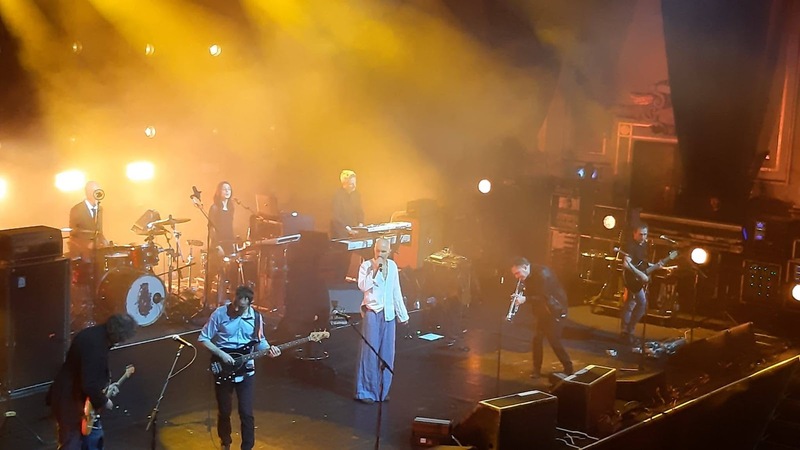 That they can pluck songs out of the deepest recesses of their back catalogue and make them feel like they belong in a set twenty years on is a rare skill James have. Picture Of This Place has Tim down on the makeshift walkway at the front of the stage, using his crutch first as support and then almost as a conductor’s baton as one of Living In Extraordinary Times’ most ambitious moments is translated to the live stage with such energy that you even see those unimpressed by the band’s refusal to get their hits out soften their stance and connect to this new music. Heads has a similar effect but with more brutal tools at its disposal, the percussion like the sound of an army marching to war, the strobes blinding and the anger in Tim’s voice at the inequalities of the white American dream palpable. Like reaching your arms around something and them joining at the back, 2018’s Heads meets 1982’s Stutter. Driven along at breakneck speed by Dave’s drums as Tim first spins on his chair then gets up to eyeball his drummer and push him yet further as the lights scream impending oblivion, it’s breathtaking, mind-blowing and a million miles away from any preconceptions you’d have of this band from the picture the twitching corpse of the music press paints of them. Attention merely confirms this, Chloe’s presence adding extra impact to the verses as her and Tim sing the first one holding hands before everyone stands stock still as it hits the breakdown. It ends with Tim crowdsurfing again, fending off people wanting to touch him or photograph his nostrils rather than hold him up as he just about makes it back to the barrier. Getting Away With It (All Messed Up) sends the place into delirium, even they do just that as they improvise their way out of the song nearly collapsing at one point with the audience barely noticing as they’re lost in the song’s undeniable communal energy. And that’s something Come Home has in spades, Andy and Chloe encouraging everyone to dance and lose any inhibitions they might have. It’s quite remarkable that it’s approaching its thirtieth birthday. Leviathan is glorious in its execution, proof that they still have it in them to deliver songs that pass the radio test (with a swearing filter required), the audience clapping along as it builds and giving into the song as it stops dead and explodes back into glorious life for one last time. Sound finishes off the main set, brooding and as wandering as ever, which is just what Andy does up on the balcony. The encore might be one of the worst kept secrets of the night as a curtain is pulled back to reveal the Love Music Community Choir who recently posted a video of How Hard The Day from Living In Extraordinary Times online and were invited by the band to perform with them. It’s How Hard The Day that starts the encore, the song lifted in the chorus by several dozen voices that transform the impact of the song’s chorus. Many Faces ends in the choir joining forces with the audience to sing “there’s only one human race, many faces, everybody belongs here” refrain, together and with one or the other leading. It threatens never to end but James want to bring Sometimes out of its hibernation for this special occasion and opportunity. 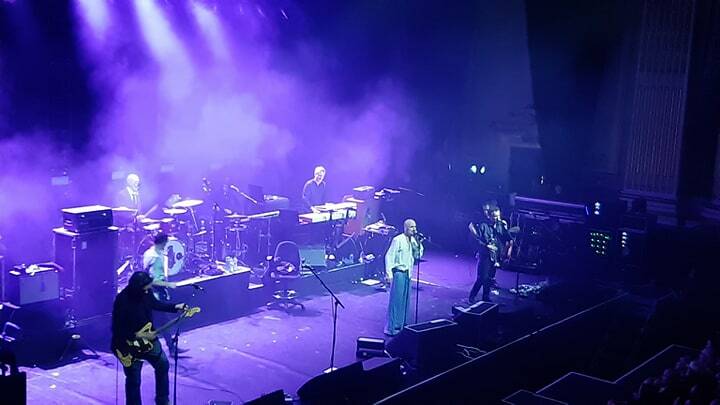 As it's James, it doesn't quite go to plan as they have to start the song three times as Tim has issues hearing what the rest of the band are playing and has to stop. The audience lap this up though, appreciating that this is part of the James experience, that they'll try things they haven't rehearsed or set up and sometimes it won't quite work. They get it sorted and the song, which was the one they'd resisted dropping for so long because of the communion feel the singalong gives it at the end, gets a fresh makeover as the choir and audience duel for who can be the loudest. James played an acoustic set of Coming Home (Part 2), Pressure's On, All I'm Saying, Just Like Fred Astaire, Broken By The Hurt and Hello followed by an electric set of Hank, What's It All About, Waltzing Along, Ring The Bells, PS, All Good Boys, Picture Of This Place, Heads, Stutter, Attention, Getting Away With It (All Messed Up), Come Home, Leviathan, Sound, How Hard The Day, Many Faces and Sometimes. James' tour continues at Carlisle Sands Centre (20), Birmingham O2 Academy (21) and Hull Bonus Arena (22) before they play Porto Coliseum (April 3), Lisbon Coliseum (4), Thessaloniki Fix Factory (June 7), Athens Release Festival (8), Isle Of Wight Festival (14), Manchester Heaton Park (15, supporting Courteeners), Eastnor Castle Lakefest (August 11), Edinburgh Princes Gardens Summer Sessions (15), Doncaster Racecourse (17), Hardwick Live (18) and Knebworth Cool Britannia (31).